Whether you need electrical installation services, or electrical troubleshooting, do not try to do these things on your own. Call a residential electrician in Chandler for all of your wiring projects. If you need to have any type of electrical work done around your home, then you need to get an electrician in Chandler. There are a lot of do it yourself projects that many people are capable of doing around their home. However, no matter how confident you feel attempting to do any type of electrical work around your home is a bad idea. The potential for something going wrong is just too high, so the smart move is to hire an electrician contractor. Taking this approach is the only way to ensure that the electrical work done to your home will be safe and up to code. Your home represents a significant investment for you, so putting it at risk by trying to do electrical work yourself is obviously something you should avoid. Even more important is the fact that faulty electrical wiring can cause a fire, which could put your life and the lives of your family at risk. If you are considering any type of electrical upgrades or repairs, then a licensed electrician can help you. Electricity is not very forgiving, so if you make a mistake while dealing with it the consequences can be quite severe. In fact, more than a few people have made the mistake of trying to do their own electrical work only to end up paying the ultimate price, their lives. Licensed electricians are trained extensively so that they can not only handle any electrical work your home needs, they can do it safely. They also make use of special tools and equipment. The point here is that a licensed electrician has access to training and equipment that the average person does not. This is what allows them the ability to perform electrical upgrades and repairs the right way. Want another reason to hire a Chandler electrician contractor? How about your safety and the safety of your home? What you don’t know can hurt you and cause a lot of damage in your home. For example, mixing copper and aluminum wire sets a time bomb ticking in your home. If you use the wrong gauge of wire you can cause a short. So don’t take any chances. 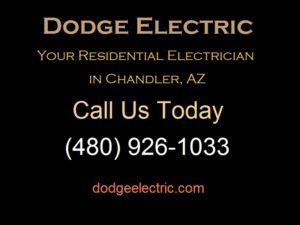 Call a residential electrician in Chandler instead.